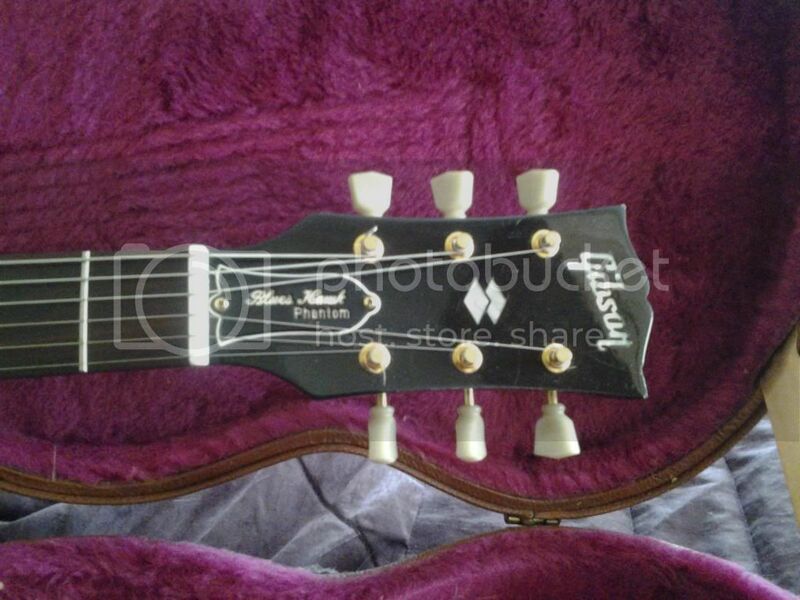 BluesHawk Club Post photos and share info on Gibson's various Hawks. I have a Blue "Blues Hawk" with soap bar pups and gold hardware s/n:02852614. I thought I had one and sure enough I found it amongst my collection,. in the middle of a bunch of empty cases. tuned it up and remembered how much of a joy it is to play. Now if I can just relearn how to. When I remember how to post a picture of it I will. I need to find out when it was made but that shouldn't be hard. I sure would have taken better care of myself"
Remember if you can remember the 1960's you weren't there. Welcome to the Gibson BluesHawk Club. Post pictures and tell us the history of your Hawk, whether it's a BluesHawk, NightHawk, or other breed within the Hawk species. Like Little Lucille or Epiphone's reissue NightHawk. I have a Blueshawk Phantom, apparently only 14 were made! It has a pearlescent scratch plate, gold coloured metal fitting, blueshawk phantom on the truss rod cover and came with a brown Gibson all as standard with the phantom (so I'm tolď). Does anyone know anything about them as I'm struggling to get any more info? 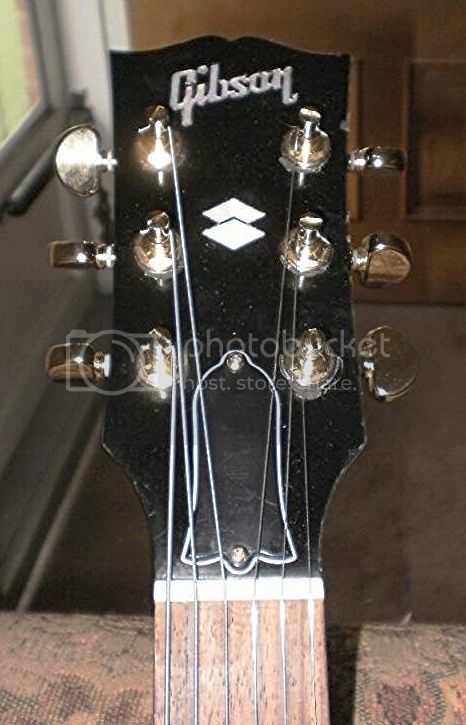 I recently had it appraised at a vintage guitar specialist in London, they also couldn't find out much more info but were aware of the limited production saying it was 13 or 14 made! They valued it at £1800.00, but I suppose its only worth as much is someone is willing to pay! You guys that can't get your Hawks setup right must just not have learned how too yet? I've got .010"s on the Blueshawk & it's action is very low with zero buzz & the tone is just astounding , I've got very little relief in the necks of either one of these guitars, BTW the Nighthawk has .009"s on it.. Bringing an old thread back from the dead as the Blueshawk will be reissued soon enough.. 25th Year Coming Up!! my first post here in the Gibson Forum! I'm from Austria so please excuse my bad knowledge of english . First of all I had to do a fret dress - the frets were too high and not round and had sharp fret ends. Than I got rid of the pickups & dummy and put in a pair of T-Armonds - unbelieveable sound. Than I had to change the electronics - put in some of the tv jones stuff - 500k pots, treble bleed, orange drop and a Dial-plate for the varitone. I love the Varitone. 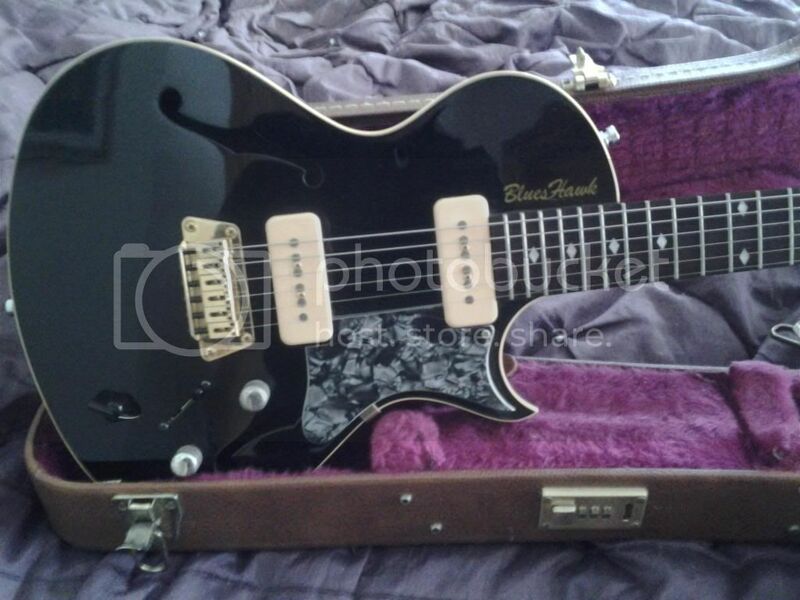 After all I wanted a 50's Rock&Roll guitar, so I need something to shimmer & shine... - so I put on a Bigsby. And that's what she looks like now. She's something that I wanna be burried with. That's a pretty pimped out Blueshawk you have there.. These guitars are a jem to play.. 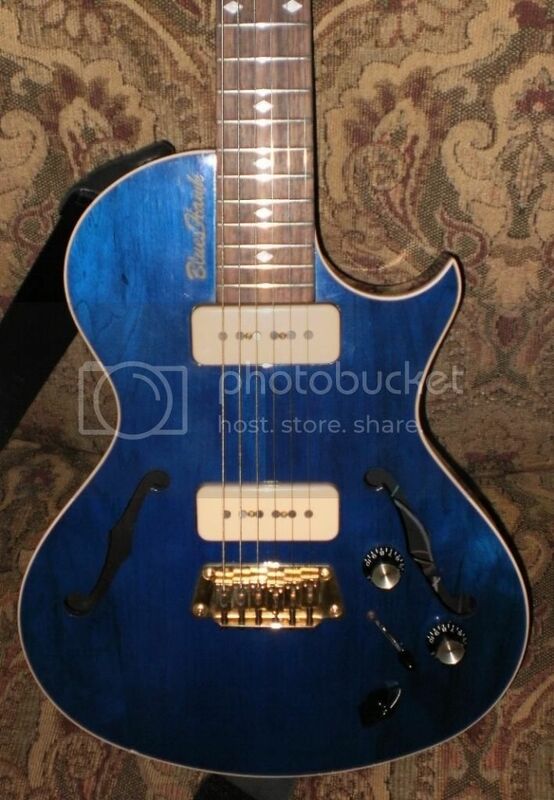 I've thought of making a Blueshawk/Nighthawk with three P-90s.. One of these days!! Thanks Headknocker, your Nighthawk looks awesome. I hope they don't do Reissue of the Blueshawk, so it can keep it's charm of the unknown soldier. Either you love it or you hate it. Most of the people who saw my Hawk wanted to know where they can get one... They couldn't believe that they where discontinued. I bought mine new in 2006 - she waited for me over a year in the musicstore after she was born in 2005. It was love for the first sight. I got a couple of offers over the years but hey - she's my baby and she'll stay with me. 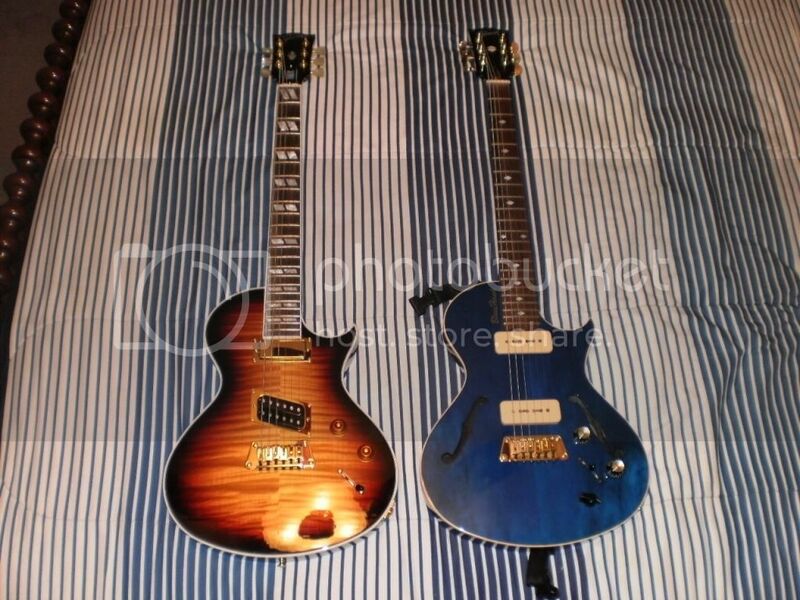 Epiphone released the Blueshawk Deluxe & I figure that Gibson will do so soon too..
My Blueshawk is a 2006 & the Nighthawk a 2013 Nancy Wilson "Fanatic"
Blueshawk has gotten a bone nut & locking Grover tuners, The Nighthawk is 100% factory.. I've seen the Epi Blueshawk. But I had a bad experience with Epiphone. I had a LP Plus wich was horrible. The Pickups were crap. The neck pickup was way louder than the bridge even when I screwed the neck all the way down and the bridge pup real high. There was a fret buzz at the 4th & 5th fret, needed a fretjob done by a tech. I guess nobody ever looked at it at the factory, because I had to set it up from 0. 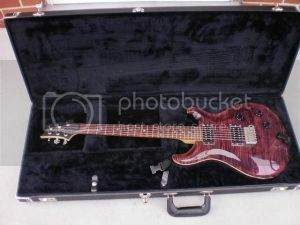 But it looked really good with its flametop & honeyburst finish and I wanted a LP but I sold it after I saw the Blueshawk and instead of the LP I found a real nice Hamer Special USA. I plugged in the Blueshawk and fell in love with her. The neck is the best I've ever played although it was sticky at the first months. I don't know what it was but after a while the "stickyness" disappeared. The strings are a bit narrower than usually but I have smaler hands so that's perfect. And with the Schaller rollerbridge I installed in combination with the Bigsby it playes like a dream and I can adjust how narrow the strings should be because the rollers are mounted on a thread - that's a cool gimmick from Schaller. If they really do a re-issue, with bigsby, maple flametop, honeyburst... I think I could fall in love. But I guess there are not enough people who'd buy it, that's why they do it with epiphone. I bet in two years they're no longer in their production line. I got my real one and love her. P.S. : A pic of the cool Schaller bridge - love it. That Schaller bridge is very cool, I've had a few basses with a Schaller with those rollers where I could adjust the string spacing = NICE!! I HAD an Ace Frehley Epiphone & it was an $800 Turd, The neck was all wishywashy & frets were horrid I ended up returning it & bought a Gibson Les Paul @ a different dealer, Pissed the seller off as they were stuck with the Dried Up Turd that they then just tried to pass off as new to someone else there out of business now.. serves em right..
USA Hamers specials are very nice too.. I've always wanted an Archtop Studio since I saw them new as a Kid & I guess that's why I bought this PRS.. The Tremolo on this guitar is so smooth & build quality is amazing.. I just picked up a Blueshawk at a yard sale on Saturday. It didn't come with a case, and I'm wondering what kind of hard shell case will work for it. Les Paul? SG? Thanks! Congrats on a great guitar score. Blueshawks RAWK! But cases are harder to find than chickens at a fox convention. Best bet, I THINK, would be the new EPI Blueshawk case. Thanks for the info. I haven't figured out how to post pics here yet, but the guitar is heavily "distressed"-most of the paint is gone from the face-it looks like water damage. When I got it, the varitone switch was down in the cavity, and the ground wire was loose. I took it to my gig on Saturday, and it sounded great. Unfortunately, it got knocked off of it's stand, and the peghead broke! I glued it up on Sunday, and I'll restring it today. Oh well, I only paid $25 for it. Etre en Passant.....just passing through (chess player)…….. Welcome to the party Drummergotagibs. Looks like you stole a good one. "Unfortunately mine did not come with a hard case. 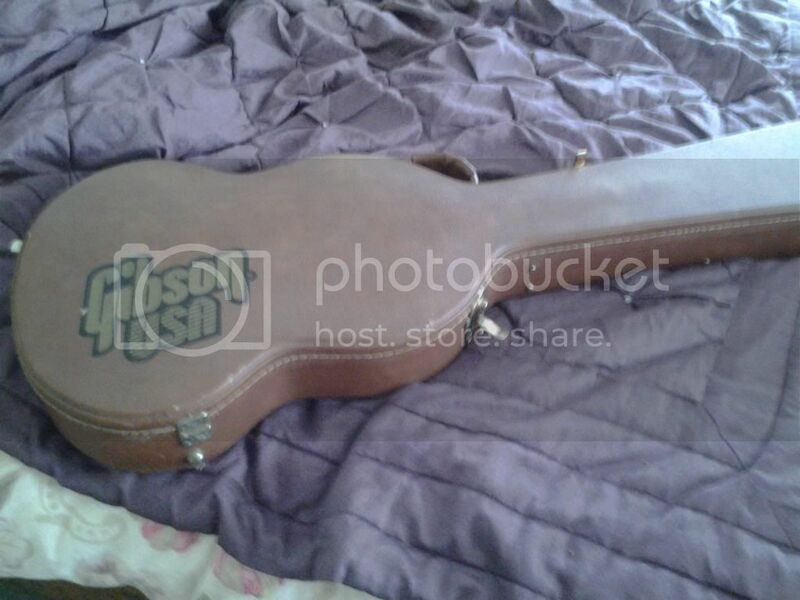 It did come with a fairly padded gig bag." Unfortunately that's the way Gibson sold the Blueshawks new. And most folks didn't bend over for the upcharge of a nice hsc. Now they are next to impossible to find. And usually demand more than you paid for your guitar. My best suggestion is to look for an older brown w/pink hsc for an SG. 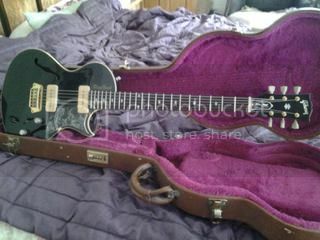 Or go for the new EPI case for the EPI Blueshawk re-issue. 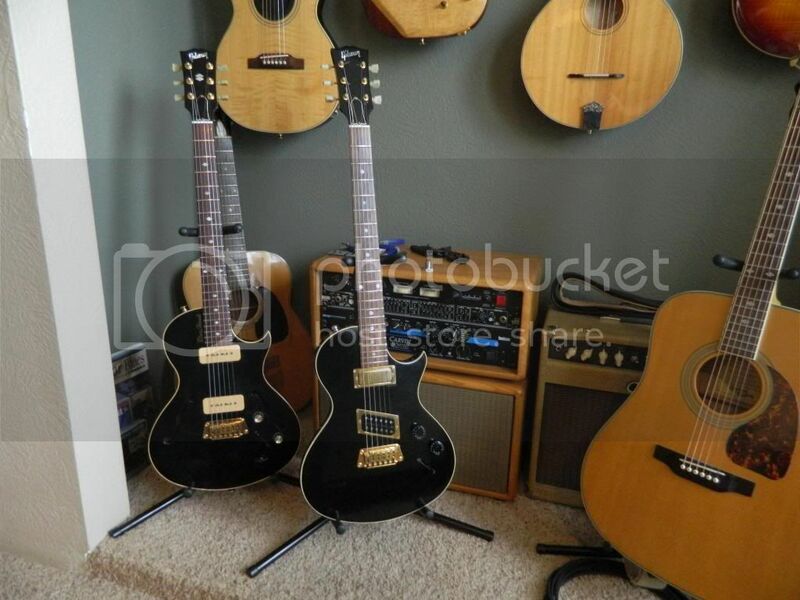 But I'd be careful of buying either without checking for fit first as I don't know for sure how well the Gibson BH matches the new EPI for size. Mostly I'd suggest just playing the heck out of it! They don't get damaged much when they're hanging around your neck. Thank you for the advise on case. I think I'll just keep my eyes open for an original case. I've seen how it fits in SG cases and don't really want to put my prized Gibson in a Epi case. I'm glad Epiphone has reissued the blueshawk and hope gibson doesn't. I can only imagine these going up in value. I have definitely fallen in love with my blueshawk. It plays and sounds like a dream. They will have to pry this guitar from my cold hands lol.